A lifting sling allows you to lift a load without causing the damage you may get from a wire rope or a chain. Light, easy to store, inexpensive, and quick to attach, round lifting slings are your go-to lifting accessory. Coming in a variety of sizes and made from 100% polyester, round lifting slings can lift up to 50 tonnes. The sling creates a circle, which can easily slip around the object you are lifting and attach to a hook or d shackle. The round lifting slings are adaptable to each lift, as anywhere on the sling you can be used as the load contact point, extending their work life. When determining the size of your sling, you must measure the sling when it is flat. Do not measure the circumference of the sling; rather, place it on a surface and pull it flat. Measure the sling tip to tip to identify the size. Always determine sling capacity. 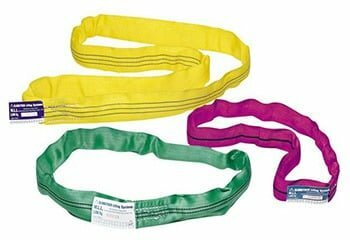 Our slings are colour coded for easy identification, but also check the tag for the work load limit (WLL) to ensure you are selecting the correct sling based on your lift. Look for contrasting colours. The material used inside the round lifting slings is a different colour from the outside layer. If you see contrasting colours on the same side of your sling, you should have it inspected to confirm its safety. Dark and dry. Keep your round lifting slings in a dark, dry area to prevent deterioration. When storing, always remove any twists or knots that many have appeared during use or transport. Use protective sleeving. Increase the longevity of your round lifting slings by placing a protective sleeve when lifting sharp loads. Find out all about round lifting slings and other lifting equipment from your experts at All About Lifting & Safety.